Not everyone is welcoming dockless bikeshare to Los Angeles. CD12 Councilmember Mictch Englander has introduced a motion that would ban any dockless bikeshare programs in the city, with the exception of pilot projects sponsored by various councilmembers. The motion calls on the city to develop guidelines for any future dockless programs, as well as penalties for providers who fail to live up to those standards. This would allow existing programs from LimeBike and Ofo to continue in the port cities and Griffith Park, respectively, but could prohibit the LimeBikes at Cal State Northridge from being taken off campus. While the motion seems a little heavy-handed, the experiences in other cities make it clear that unregulated dockless programs invite problems, along with the inevitable bikelash from people who find the bikes on their lawns or blocking the sidewalk. Let alone in their trees or swimming pools. Hopefully Englander and the council can find a way to develop effective regulations without stifling the growth of what could be a very effective way to reduce motor vehicle traffic. Thanks to TJ Knight for the heads-up. Police in El Monte are asking the public to be on the alert to help find a hit-and-run driver who critically injured a bike rider. Thanks to Tim Rutt for the tip. There will be a pair of public meetings next month to discuss a proposal to convert Pasadena’s Orange Grove Blvd into a complete street. A man riding a bicycle was injured in a collision near the Calgrove onramp to the 5 Freeway in Santa Clarita; no word on his condition. 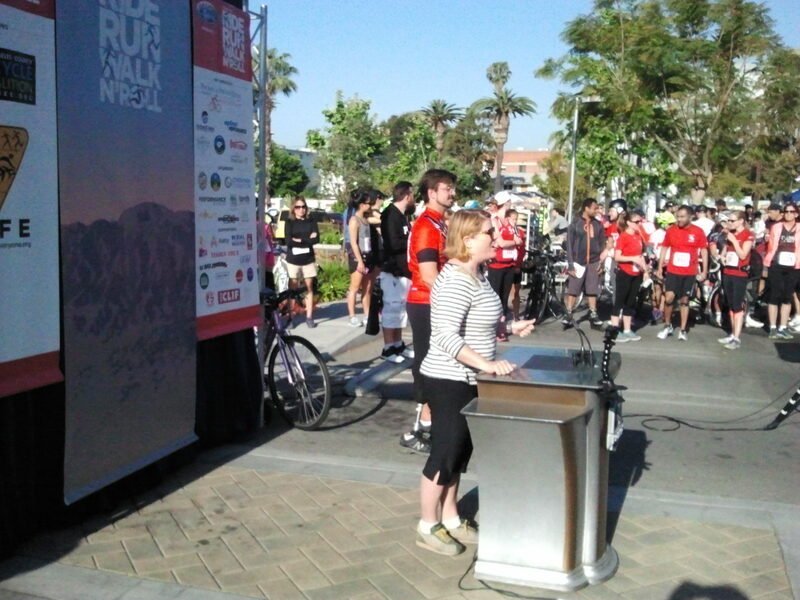 Nina Moskol, chairperson of the Santa Clarita Bicycle Coalition, had this to say afterwards. The location of this crash is a known bike corridor. The County has proposed bikeways plans to improve this area. The Santa Clarita Valley Bicycle Coalition has been discussing this area at every opportunity with LA County, Cal Trans, and City transportation officials. To date, we have had no word as to what proposed improvements for safety will be implemented, when, or where exactly. What we do know is that this freeway/County road interchange is complex and under heavy use because of ongoing construction on the I-5 to complete pavement restoration (and possible HOV lanes). We encourage everyone to ride safely and carefully. Curbed says the new Glendale-Hyperion Bridge will feature protected bike lanes on both sides, which would be a change from the painted bike lanes called for in the original plans, but it would still have just one sidewalk on the north side. 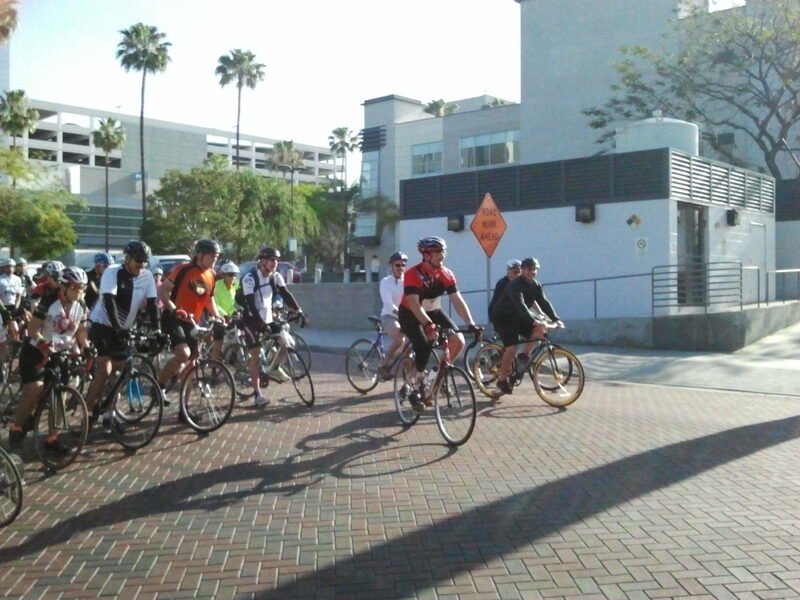 Somehow we missed this one, as Metro’s BEST program hosted a tweed ride in Culver City yesterday. The LA Times reports on Montclair’s ridiculous law banning pedestrians from crossing the street while using any electronic device, including headphones or earbuds. Officials opened the first section of the planned 50-mile CV Link bikeway around the Coachella Valley. Or it would be 50 miles, if Rancho Mirage was willing to let it besmirch their fair city. Protected bike lanes could be coming to Oakland’s Lake Merritt. Marin’s anti-bike lane crank columnist ridicules comments of a mode shift on a Bay Area bridge, saying 235 bike crossings a day pale in comparison to 71,000 motor vehicles. He’s got a point, although the question is whether there are any safe connections on either side of the bridge that encourage people to ride across. Good piece from Bike Snob’s Eben Weiss, who says we need to get more kids on bikes. Some Portland bike shops are beginning to shun brands owned by Vista Outdoor, which has been linked to a maker of ammunition and AR-15-type weapons. A Wisconsin nonprofit intends to refurbish 1,000 bicycles to donate to local kids next month. Heartwarming story from Milwaukee, where motorcycle maker Harley Davidson helped design a custom adaptive tricycle for a four-year old boy born without legs and forearms. And no, the story doesn’t explain how he’s going to pedal it. Two Indiana men face up to 30 months in prison for building an illegal singletrack trail through an Indiana nature preserve. A Philadelphia councilwoman proposes requiring city council approval for any bike lane that could affect the flow of traffic. Never mind that people on bikes are traffic, too. A Caribbean-based physiotherapist explains how to avoid minor injuries when you start riding. Life is cheap in the UK, where a road raging driver who threw oven cleaner on a bike rider — with her two kids in the car, no less — and leaving the victim with severe chemical burns, walked with a 12-month suspended sentence. A British soldier has gotten six years for fatally slamming his car into a man riding his bike, after he was shown on video downing five beers and three shots in a pub. Road.cc looks at presumed liability, which is the norm in most of Europe, and whether it would make streets safer for cyclists in the UK. If we ever want to end car culture and the automotive hegemony on our streets, we’ll have to adopt some form of presumed liability, which assumes the operator of the larger vehicle is at fault in any crash, because they have a greater responsibility to avoid a collision due to their greater ability to cause harm. A Scottish newspaper makes the case for a 20 mph speed limit, saying initial opposition has died down nearly a year after it was implemented. CNBC has discovered Copenhagen, where officials say traffic would come to a standstill if 15% to 20% of bicyclists switched to motor vehicles. 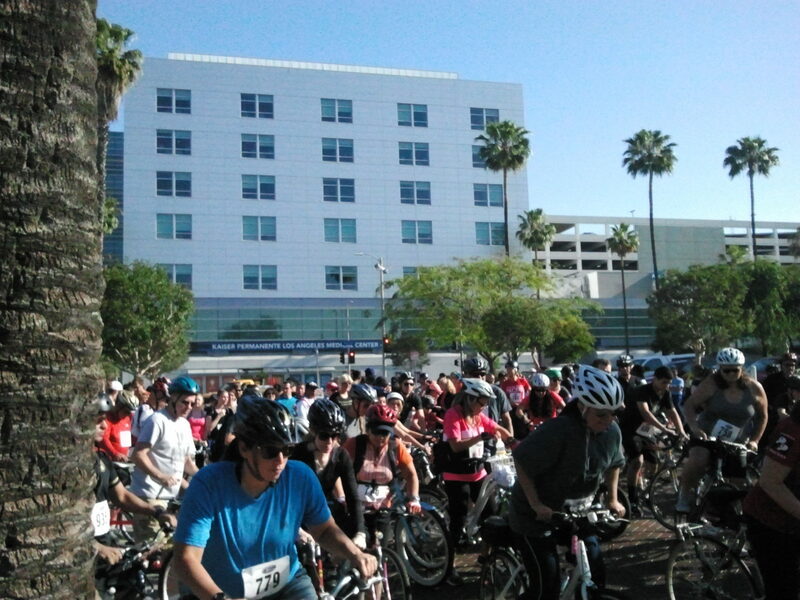 Which suggest that getting 15% to 20% of Angelenos on bikes might get traffic moving again. Chinese dockless bikeshare company Gobee has pulled out of Paris without warning, after quitting other European cities due to extensive vandalism. Evidently, bike riders are second-class citizens in Kolkata, where they’re required to get off and walk their bikes across major streets. A Canberra, Australia newspaper says there’s no reason for the country’s Capital Territory to reconsider its mandatory helmet law, which it calls a proven lifesaver. Even though multiple studies have questioned whether the health benefits of bicycling outweigh the benefits of bike helmet laws, which have depressed bicycling rates in Australia. Japan is considering plans to build a suspended bikeway under a bridge connecting Shikoku and Awajishima islands. Or you can ride a 44-mile route connecting six islands in Japan’s Seto Inland Sea right now. ESPN considers how Cal Berkeley law school dean Molly Shaffer Van Houweling broke the 12-year old hour record in 2014. Yes, the cycling season is underway already, as Spain’s Alejandro Valverde takes the Abu Dhabi Tour, and Dylan Groenewegen wins on the frozen cobbles of Belgium’s Kuurne-Brussels-Kuurne. The best way to get over a bad breakup? Ride across the US. When the real Tour de France leads leads to fictional romance. And now you, too, can own your very own dockless bikeshare bike to leave anywhere you want. As a resident of LA’s 4th Council District, I have long been concerned about the risks that drivers, pedestrians and bicyclists face in our district. One area of particular concern is 6th Street between Fairfax and La Brea. As you are no doubt aware, 6th is a two-lane street west of Fairfax, then becomes four lanes between Fairfax and La Brea. Once it widens to two lanes in each direction, the character of the street changes dramatically. Speeds increase while drivers jockey for position, often shifting lanes without warning to go around stalled traffic or turning vehicles. As a motorist, it is an unpleasant street to drive, and one requiring constant concentration. As a pedestrian, it is a difficult, and at times dangerous, street to cross. And someone who used to bicycle to Downtown when I lived in West LA, it was easily the most dangerous part of my commute. This is borne out by the two pedestrian deaths and hundreds of crashes that have been recorded on the street over the last several years, as well as statistics showing 6th Street is three times as dangerous as the average LA arterial. Fortunately, there is a proposal from LADOT which would address these issues by removing a traffic lane in each direction and adding a center left turn lane, with bike lanes on each side from Fairfax to Cochran. Lane reductions like this have been shown to improve safety up to 47%, with an average of 30% improvement in cities across the US. Those same results have held true with previous road diet projects here in Los Angeles, as well. Further, this is a project that has the full support of the surrounding community. The Mid-City West Community Council voted unanimously to back this project over a year ago. Before you were elected to office, you told the Los Angeles County Bicycle Coalition that you start and end any decision with the community. In this case, the voice of the community is clear. It is long past time to improve safety on this dangerous street. I urge you to immediately support this project as recommended by LADOT. If you want to write in support of the proposed 6th Street road diet, send your email to [email protected], and CC [email protected], [email protected], and [email protected]. You can find a brief sample email you can use as a template here (pdf). Mar Vista Community Council’s bizarre bike “safety” motions and efforts to roll back the Venice Great Streets project will be back on the table when the Transportation and Infrastructure Committee meets tonight. Among the motions under consideration are one that would require bike “night lights,” even though front and rear bike lights and side reflectors are already required under state law for any bike ridden at night. It would also require mandatory bike helmet use for all riders, regardless of age, even though that would conflict with existing state law, which means the city has no authority to mandate their use. Another motion calls for restoring the two traffic lanes that were removed from Venice Blvd as part of the Great Streets Project by removing the center median, or placing a center bike path there. Both of which show a clear lack of understanding of traffic calming, as well as bikeway design. Center medians are used to slow traffic and prevent unsafe left and U-turns, as well as head-on collisions with speeding drivers who cross the center line. Meanwhile, center bikeways create multiple conflict points at every intersection, dramatically increasing the risk of injury collisions. Which is why existing median bikeway on Culver Blvd failed. As alternative, they suggest restoring the traffic lanes by removing street parking, and replacing it with parking garages every three blocks — with no hint of where to put them or how to pay for it. A final motion simply calls for removal of the entire Venice Great Streets project in order to restore three lanes in both directions. Clearly, someone on the committee has a fixation with doing everything in their power to keep Venice Blvd dangerous. And at the same time, allowing traffic to continue destroying the fabric of the Mar Vista community, reverting back to a virtual highway to keep peak hour traffic flowing, with excess capacity the rest of the day. All of which suggests a complete and total ignorance of state bike laws and traffic safety planning, as well as the benefits of road diets. Which is what happens when you put people in charge who have no idea what they’re talking about. Instead of the misguided, illegal and impractical motions on the agenda, maybe they should replace them with a single motion requiring every member of the Transportation and Infrastructure Committee to actually learn something about the subject. If you can make it there tonight night, maybe you can try to explain it to them. Thanks to N.E. Farnham for the heads-up. A new motion from the usually bike-friendly 12th CD Councilmember Mitch Englander (pdf) could potentially halt all new bike lanes in the city of Los Angeles, as well as rip out many existing lanes. The motion comes in response to the latest city settlement with an injured bicyclist, as the LA city council voted to pay $7.5 million to a man who was left paralyzed from the neck down after hitting a ridge of pavement that had been lifted four inches by a tree root. And which the city had previously been warned about, but done nothing to fix. Never mind the 17 other lawsuits that have been filed against the city by injured bike riders, or the relatives of those killed, this year alone. Many, if not most of whom, weren’t riding in bike lanes when they were injured. Englander’s motion, which was seconded by the 2nd District’s Paul Krekorian, would require that new bike lanes only be installed on streets with a pavement quality grade of A. Which sounds good, until you consider that LA’s streets average a C plus. So basically, new bike lanes could only go on new pavement. To make matters worse, the motion calls for closing or removing bike lanes from any street with a pavement grade of B or lower. Which would mean most of the bike lanes in the City of Angels would be unceremoniously stripped off the pavement. The practical result would be that people would still ride those same streets, and be subject to the same bad pavement, but without the separation from traffic that bike lanes provide. So any falls, or swerves to avoid cracks or potholes in the pavement, could be catastrophic. And by removing a proven safety feature, the city’s exposure to liability could be exponentially higher when, not if, someone is injured on one of those streets. The motion isn’t all bad, however. The requirement that pavement quality on current bike lanes be inspected is something that should have been passed into law decades ago. As anyone who has ever ridden the 7th Street bike lanes leading to and in DTLA can attest. And pavement quality should be considered before installing new bike lanes, rather than just slapping paint down on failing streets, as has been the practice in the past. If the motion advances, which is not a given, it must be amended to so that only the bike lane would be required to have an A grade, which would allow just that portion of the roadway to be patched or repaved to bring it up to code, rather than the entire street. Although that would give drivers one more reason to hate us. And the misguided requirement that existing bike lanes be closed or removed should be stricken, period. Thanks to T.J. Knight for the tip. 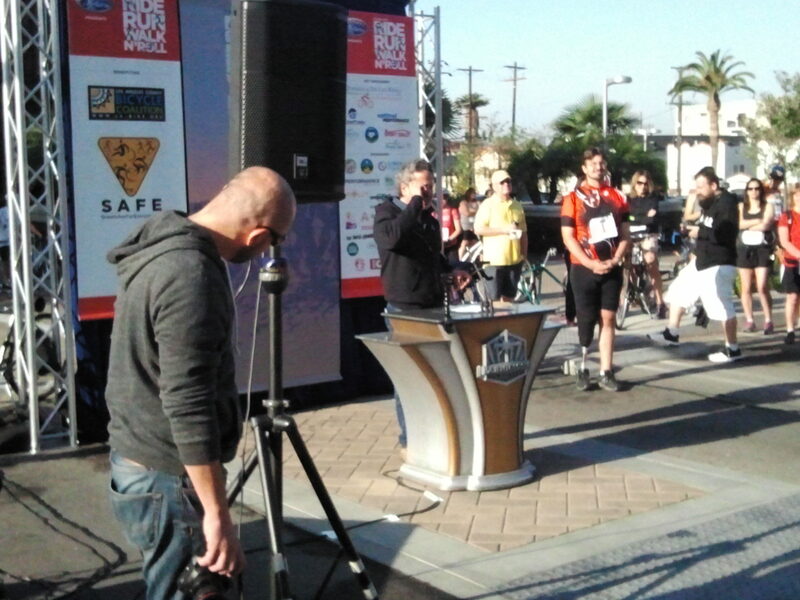 In what they describe as a win-win for everyone, the San Diego State University Police Department has teamed with the San Diego Association of Governments (SANDAG), the San Diego County Bicycling Coalition and Cycle Quest Bicycle Store to fight bike theft. 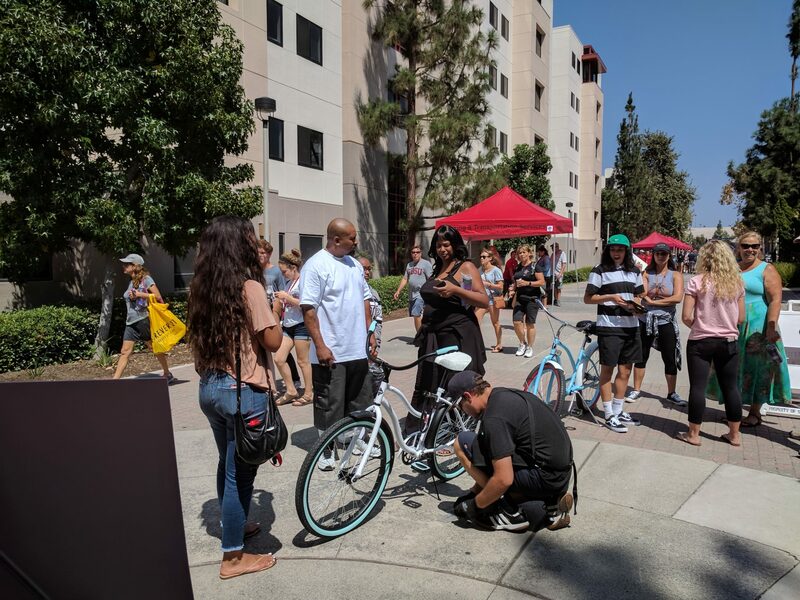 The groups worked together to register 150 bicycles with the university’s bike registration program, which is open to students, faculty and staff. 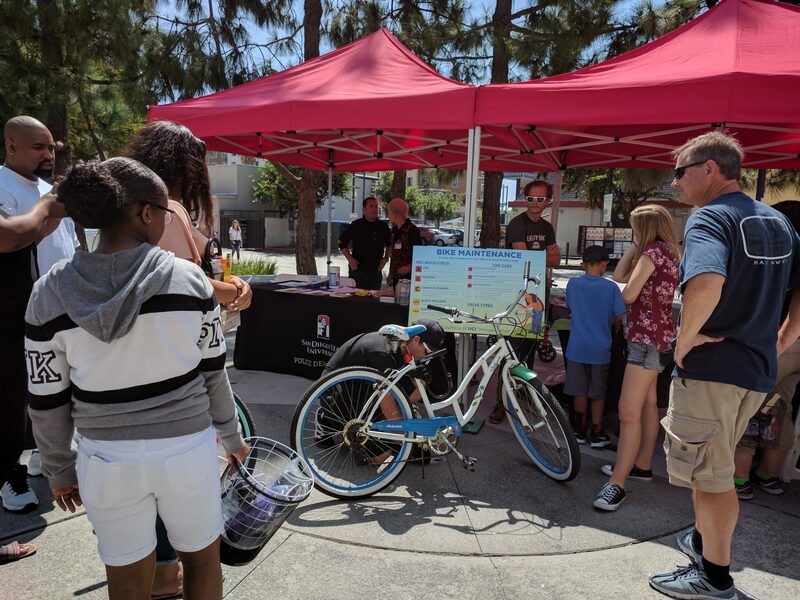 Everyone who registered their received a free Kryptonite lock and mount, as well as free bike repair, and bike lights and literature from the SDCBC. Which is almost enough to make me want to go back to college. Including these 150 bikes, the university has registered 476 bikes so far this year, ensuring that the information will be available if anything should happen to the bikes. They report that 81 bikes have been reported stolen since the first of the year, most of which were secured by just a thin cable lock or locked to the rack by the front wheel alone. And yes, they also instruct students on how to lock their bikes properly when they register them. VeloNews considers how the Vuelta became cycling’s most dramatic grand tour. Like father, like sons. A Lithuanian cyclist has been suspended following a positive drug test, 15 years after his father tested positive for EPO after finishing third in the 2002 Tour de France, and just months after his brother died as a result of suspected doping. Spain’s Samuel Sanchez got fired from the BMC team after his B sample confirmed his positive doping test prior to the Vuelta. But really, the doping era is over, right? Everyone has an opinion about the proposed restoration of the Ballona Wetlands. Including an environmental advocate who says reversing the Playa del Rey road diets will mean more roadkill. Hopefully, she doesn’t mean us. Manhattan Beach approves new bike route signs, buts holds off on sharrows over fears that they make bike riders “more assertive about occupying road space.” In other words, they’re worried about those uppity bike riders wanting to ride exactly where the markers on the road say they’re supposed to ride. San Diego won’t be changing their sidewalk policies, even after a man was awarded $4.85 million when he was severely injured riding his bike on a tree-damaged sidewalk the city had known about, but failed to fix. Sound familiar? Over 1,000 bicycles have been stolen in San Diego this year. A Los Altos writer offers five rules to live by as a cyclist. Although he says not to ride three abreast, even though it’s perfectly legal on non-sharable lanes, as long as you stay within a single lane; however, you should always allow drivers to pass when it’s safe to do so. San Francisco advocates discuss the status of Vision Zero in the city. The North Bay Area’s new SMART trains are dealing with an unexpected crush of passengers boarding with bicycles. Which shows who the smart ones really are. Someone please tell the Mountain View city council that removing a crosswalk is not a safety improvement. Sacramento’s mayor tries out a new three-day pop-up parking protected bike lane. A lifelong roadie turns to dirt jumping at the age of 44, as Bicycling asks if it’s too late him to catch big air. Easy answer: If you’re not dead, it’s not too late. New York’s Citi Bike bikeshare reaches its 50 millionth ride. A UK writer says it’s time to modernize the country’s traffic laws, but adding offenses for bicyclists is not the place to start. A British cyclist urges others to get trained in CPR; he was revived after his heart had stopped for 30 minutes while riding. A London journalist captured a month’s worth of close calls on his bike cam to show how dangerous riding in there can be. Who says you can’t eat or drink on a bike? If you’re a convicted felon illegally carrying a handgun on the spokes of your bike, put a damn light on it — the bike, that is, not the gun. And if you’re riding your bike with two outstanding warrants, don’t use your knife to threaten a driver who honks at you. Or a hatchet. Or better yet, just don’t. Period. Sometimes it’s better to let the pictures tell the story. 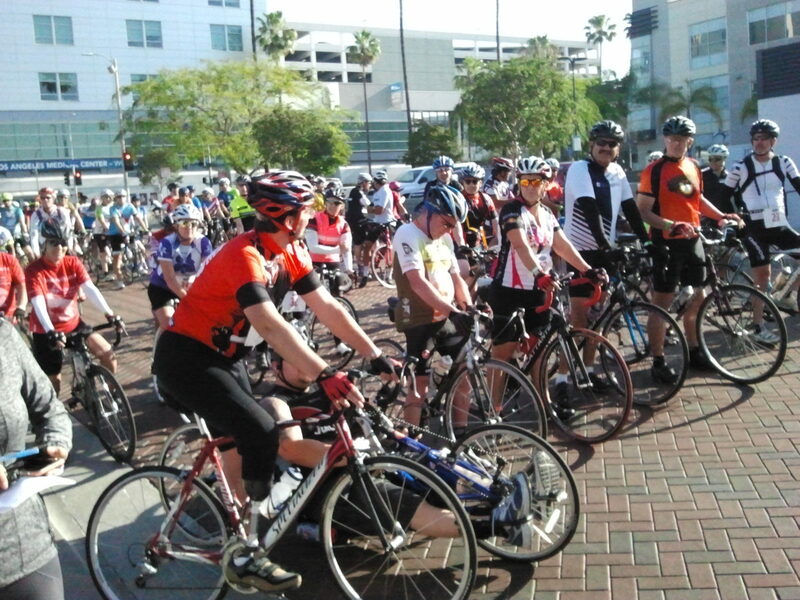 So here are a few images and random thoughts from the start of Sunday’s Finish the Ride. 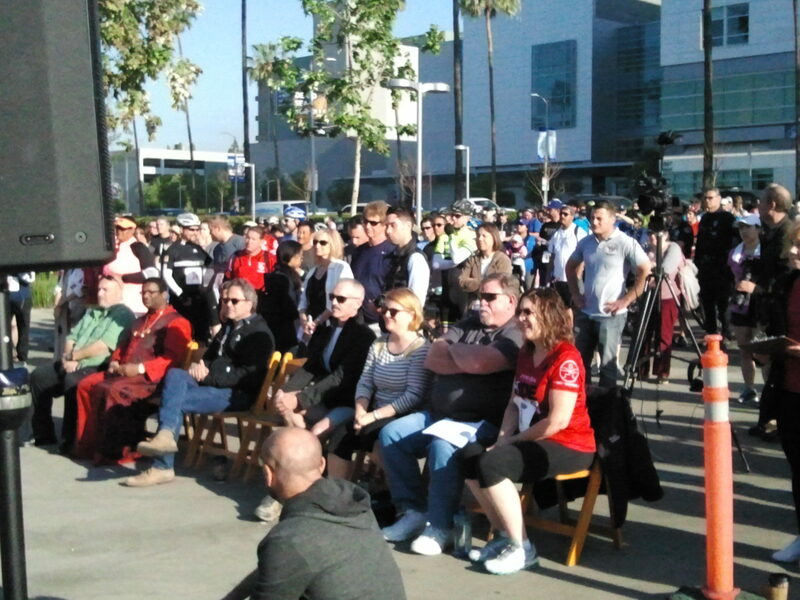 Despite the early morning start, hundreds of people turned out in Hollywood to join the fight against the epidemic of hit-and-run. 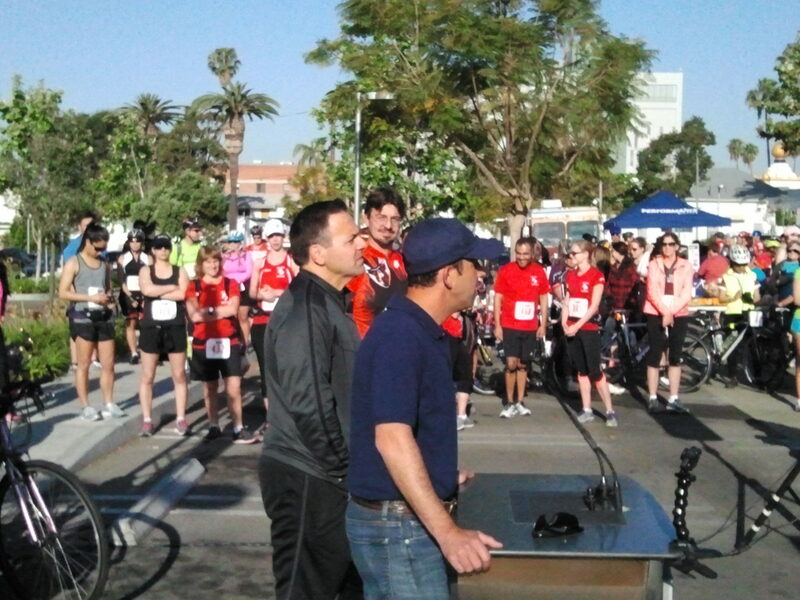 People of every description came together to ride, roll, walk or run; two LAPD officers even ran the 10k route in full uniform. Nice to see new LADOT General Manager Seleta Reynolds and Executive Officer Bruce Gillman front row center, a sign that the city is finally taking hit-and-run seriously. 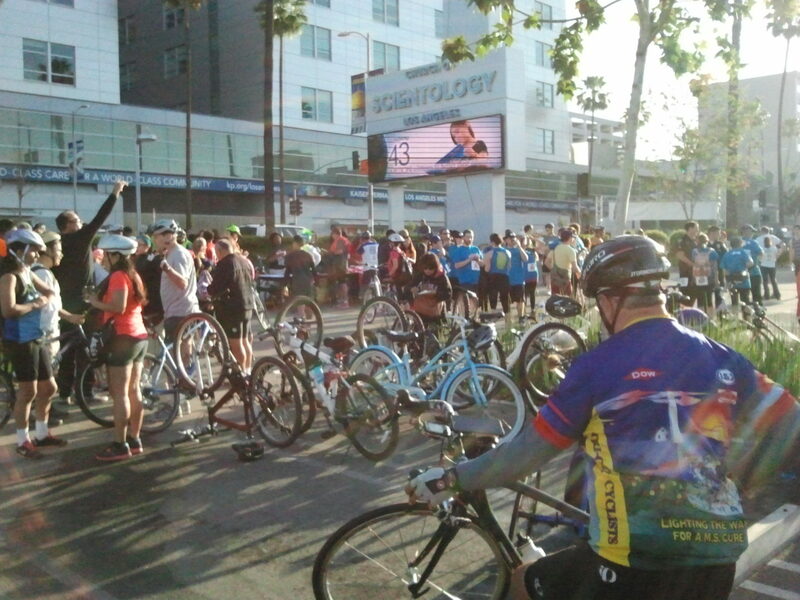 Surrounded by a sea of bikes, two women waited for their chance to skate the route. Not all the participants were human. 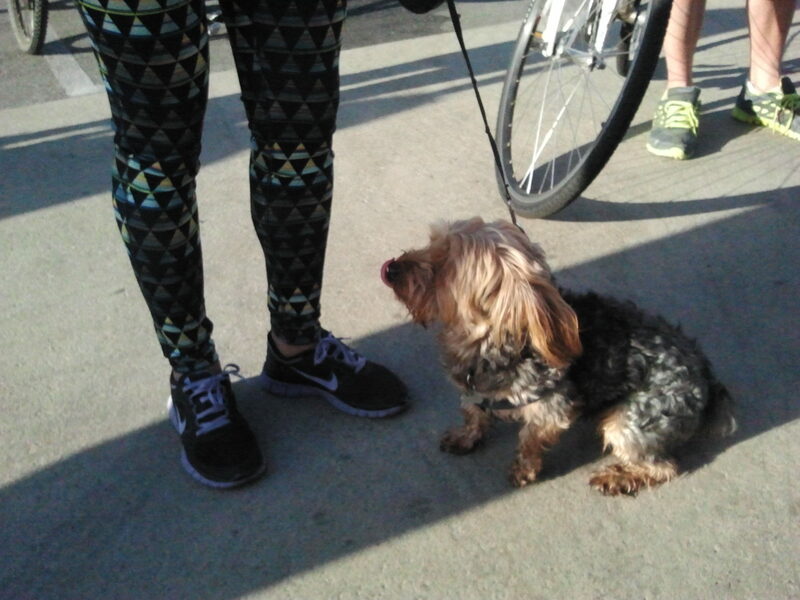 Even a dog knows leaving someone lying injured and bleeding in the street — or worse — is inhuman. The ride marshals gathered before the start to discuss the routes and how to keep the participants safe on streets that were shared with cars. 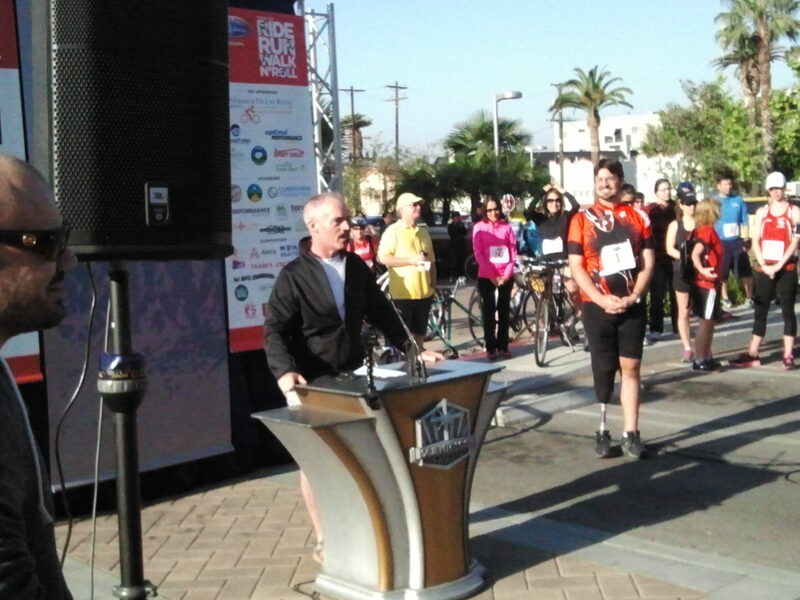 Finish the Ride founder Damian Kevitt joins the assembled riders for the start of the 50-mile ride; it was only two years ago that he lost his leg in a horrific hit-and-run. 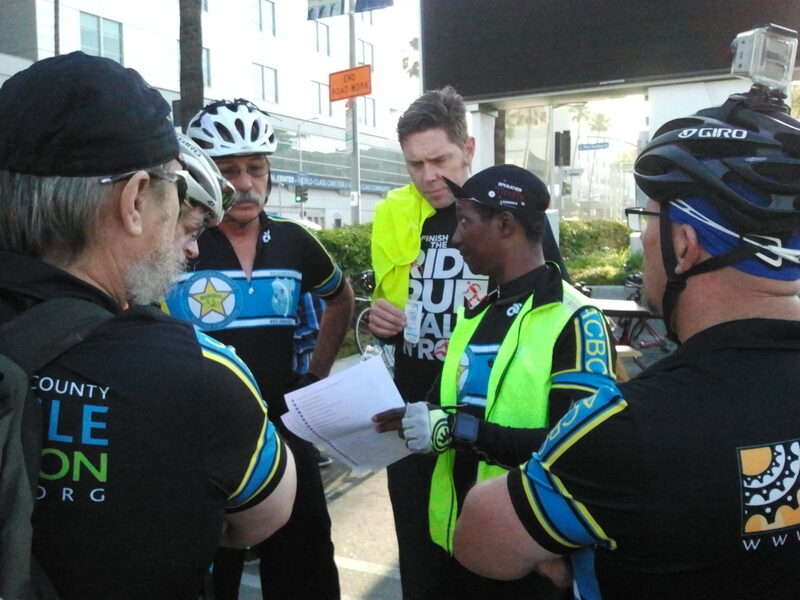 Kevitt sets off to lead the ride, just as he has lead the fight against hit-and-run since recovering from his life-threatening injuries; the driver who fled the scene after dragging him onto a freeway onramp has never been found.